And so here we are at The Cape: 1969 #3, the power is in Captain Chase’s hands, and with two issues to go, the only question remaining is: how will he use it and how far will he go? For anyone not reading The Cape: 1969, it follows a medevac pilot in Vietnam who just so happens to be the father of Eric and Nicky, the brothers from The Cape. He finds himself in a bad situation, against a sadistic Vietcong troop commander, and then some Weird War Tales stuff happens. Writer Jason Ciaramella is committed to making this a rather believable war story with superpowers instead of a story about superpowers that just so happen to take place in a historical setting; or at least a good war script with superpowers. Artist Nelson Daniel is a great companion to this project. His drawings aren’t ‘gritty’, but certainly show enough ability to make a war story, and are actually quite refreshing in contrast. Meanwhile, his use of colors remains top notch. His palette of ruddy browns, greens, and oranges complement the dark tone of the story; he also has a special knack for making grotesque violence distinct with blazing reds saturating the backdrops enough to bleed through the page. The use of screen tones is a little obtrusive here, without giving the book the vintage charm I think he’s going for, but it’s not a big deal. 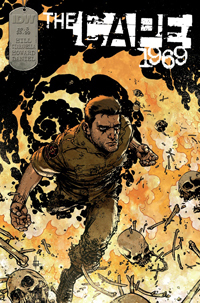 IDW Publishing announced on Tuesday that they would be publishing a prequel to the hit mini-series The Cape from Joe Hill, Jason Ciaramella, and Nelson Daniel to provide the origins of the story with The Cape: 1969. The Cape: 1969 is a look at the dark origins of the mystical piece of cloth that was featured within the pages of The Cape. The story centers around a group of American soldiers fighting through the Vietcong during The Vietnam War. In this we will see where the powers of The Cape originated. Continue reading for more and to see the covers for The Cape: 1969. There are a lot of comics out right now that deal with fantastic people with amazing powers who are, well, kind of jerks. 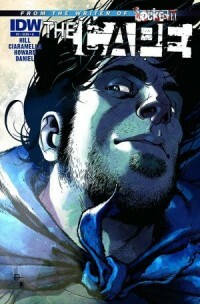 The Cape #2 (of 4) for IDW Publishing is another one of these books, and it is also one seriously messed up comic. I mean, there is some really freaky stuff going on in this book. And you know what? I don’t have a problem with that because it is one well done comic. How The Cape sets itself apart from books like Irredeemable is that while it has some superhero elements, it is more of a grounded story with normal characters and a situation that many can identify with. 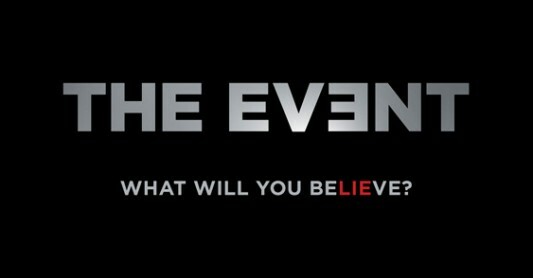 ‘The Event’ Returns To Replace ‘The Cape’ On NBC Tonight; Catch-Up Now! The Event returns tonight at 8/7c replacing The Cape in NBC’s struggling Monday night lineup. The series stumbled a bit in the first couple of episodes but it recovered solidly by episode four and shifted to a fast-paced LOST-meets-X-Files (not as good as either, though) type of series that’s worth a look. The Event doesn’t hold back the answers, instead it gives up the goods and makes the adventure the real mystery. The story has an epic feel that’s still missing in V with the huge story sitting on the shoulders of a single couple and a little girl. It’s complex and it could collapse under the weight of that complexity but if it doesn’t and if it stays alive it could be appointment television. Sure that’s a lot of ifs, but hey, coming off the mess that was The Cape we have nowhere to go but up. Continue on below to get acquainted or re-acquainted with The Event with a synopsis, recap video, and preview of what’s in the future of the show. You can also join me tonight on Twitter to live chat about the show as it airs; follow @culturesmash. Our January Doom Of The Month will be Darwyn Cooke’s adaptation of Parker: The Outfit! If you want to read along with us, head on over to Instocktrades.com or DCBService.com to pick up Parker: The Outfit for a super price! Be sure to check back at the end of January for our special review episode. 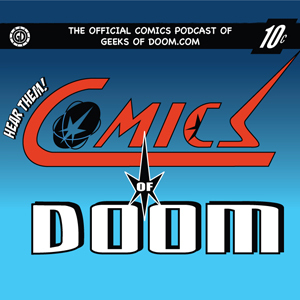 Check out Episode 39 of Comics of Doom, the official comics podcast of Geeks of Doom, where we review Sweets #4 and discuss the pilot episode of the new NBC series The Cape, along with the latest news. Click HERE to open the podcast player in a new window. Podcast player is here below, along with an Episode Guide. It’s easy to see why Hollywood loves a good superhero story. The genre has become so popular over the past couple of years, it’s no wonder why everyone is in such a rush to strike while the iron is hot and cash in on the trend. While the story in a superhero movie like The Dark Knight is a great one, providing the essential themes of good versus evil and the power of one man, etc., The Cape tries to follow that same method for success. The difference between these two is that the television series The Cape, which debut on Sunday January 9, 2011, isn’t The Dark Knight. Not that it’s really intending to be, but it’s not even as good as other superhero television shows. The premise for The Cape sounded like something that, on paper, should be a great execution of the genre. A cop gets framed for a crime he didn’t commit! He turns over to a life of heroics to protect the ones he loves! But that sounds familiar, doesn’t it? Maybe even a little bit too familiar? With the new year comes brand new television and over the following days and weeks, we’ll take a look at the premieres of the Winter’s hottest shows in our Winter 2011 TV Primer! 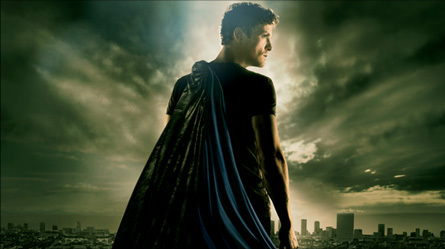 Tonight on NBC at 9/8 Central, will see the premiere of the new superhero epic, The Cape. Tonight is an exclusive two-hour preview event, after which, the show will take over the 9/9 Central slot on Monday nights. Below is the official NBC summary for the show, which stars David Lyons, Summer Glau, and Keith David. Also, we’ve also included a handful of teaser trailers and clips. Check out some of them below! Check out our pics from The Cape‘s viral event in New York City: NYC Statues Get Caped For NBC’s ‘The Cape’. Will you be tuning for THE CAPE tonight? So I’m strolling along the post-blizzard streets of New York City earlier this week when I spotted a new stand-up plaque at the foot of the William H. Seward statue at the southwest entrance of Madison Square Park. From afar I spotted the words, The Cape, which I know is new superhero drama premiering this weekend on NBC. As I got a little closer, I realized that the statue of Seward was now newly adorned with a flowing black cape! I crossed the park to find at the other end the statue of Admiral David Glasgow Farragut was also donning a cape and had a similar plaque as well. Check out the photos I took of the statues here below. It was an amazing sight, I’m glad I happened upon it!